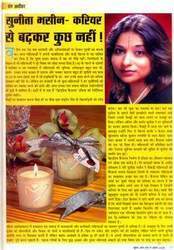 Established in 1995, Crafts & Social Development Organisation are one of the foremost Manufacturer, Wholesaler, and Service Provider an extensive array of best grade Aromatherapy Candle, Taper Candle, Pillar Candles, Floating Candle, Square Candle, T Lite Candle, Votive Candles, Printed Candle, Decorative Candle, Gift Set, Diwali Gift Sets and Valentine Candles. To manufacturing of the offered products in compliance with the set industry standards, our experienced professional use the modern machines. In addition to this, these products can be custom designed in line with the requirements detailed by the clients. The offered products are highly demanded by the clients for gifting purpose. By manufacturing offered products as per the industry laid norms, we believe in establishing a long term relationship with our prestigious customers. In addition to this, we have been able to fulfill the increasing demands and needs of our valuable clients. We have a vast infrastructure spread over a huge area and equipped with all the required machines to manufacture the offered products. For smooth and error free production, we have divided it into different units such as, manufacturing, quality, and warehouse. Apart from this, we are offering these products at affordable prices to our valued customers. Set up and assisted by our mentor, Ms. Sunita Bhasin, we have been able to create a huge patron across the nation. With the help of her sharp business approach and skills, we have gained a reputed position in the market in such short period of time. With the help of his only, we are able to satisfy our clients in such a way. For manufacturing and designing a qualitative collection of candles and gift sets, our sophisticated infrastructure facility helped us to manufacture the offered products as per the industry laid standards. Our well developed and equipped infrastructure unit is equipped with the ultra-modern machines and progressive technology. Further, for the smooth compilation of our business operations, we have categorized our infrastructure into several sections. 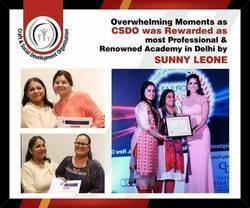 An amazing moment for CSDO TEAM winning the reward academy in Delhi by Sunny Leone.The fabulous performance that academy has provided in so many years is absolutely amazing . CSDO is known for the best services being offered for self-employment courses! We are the best name in the market offering best and excellent quality array of candles at very cost effective rates. We have professionals that are most qualified and skilled in this realm. They manufacture this array with the use of cutting edge technology and skills to keep these candles best and beautiful. They are tested along side with many quality norms to keep it best and excellent. With best quality assurance and we also offer easy replacements and exchange that make our customers relaxed and contended. 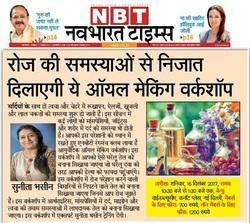 OIL MAKING WORKSHOP PR IN NBT TIMES NEWSPAPER - CSDO has helped many to learn how can you make your skin glowing and treat it with amazing delights by conducting Oil making workshop. If chocolate making is a fantasy for you then CSDO is a place that can help you to make your dreams come true! Craft & Social Development Organisation is a premier training institute that is known for bringing change and success among the individuals who are desperate to set up their own venture and be the boss. The institute makes effort to empower both genders in the society by providing them complete knowledge of the possible business opportunities. We provide training that improves individual skills and assures of complete support from the professionals in the individual industry. Our mission is to generate awareness among people about the new business opportunities and explore hidden talent. CANDLE MAKING IS AMAZING PROFESSION ISN'T IT ! !